Crocuses (Crocus spp. ), which include about 80 species, bloom in late winter, spring and fall. Each type blooms for only a few weeks each year. So to keep your garden in bloom, plant a variety of spring and fall crocuses as well as a few early bloomers to help shake off the late-winter chill. Crocuses are hardy in U.S. Department of Agriculture plant hardiness zones 3 through 9, depending on the species, cultivar or variety. Spring crocus (Crocus vernus) is a common spring-blooming crocus species. Hardy in USDA zones 3 through 8, it has white or purple flowers. If you want to add variety, plant its cultivars, which offer a slight variation and also also are hardy in USDA zones 3 through 8. Try "Pickwick," a cultivar that has blooms with purple with dark stripes, "Striped Beauty," which has purple flowers with white stripes, or "Jeanne d'Arc,"a white-flowering cultivar with a dab of purple at the base of each flower. Numerous spring-blooming crocus species flower in a range of colors, from yellow to white to purple. Add a splash of sunny color to the spring garden with yellow crocus (Crocus flavus). That species, hardy in USDA zones 4 through 8, has bright orange-yellow flowers. Other spring-blooming species include the lilac- or purple-flowering pygmy crocus (Crocus minimus), hardy in USDA zones 3 through 8, and Corsican crocus (Crocus corsicus), which has lilac-colored flowers and is hardy in USDA zones 6 through 9. 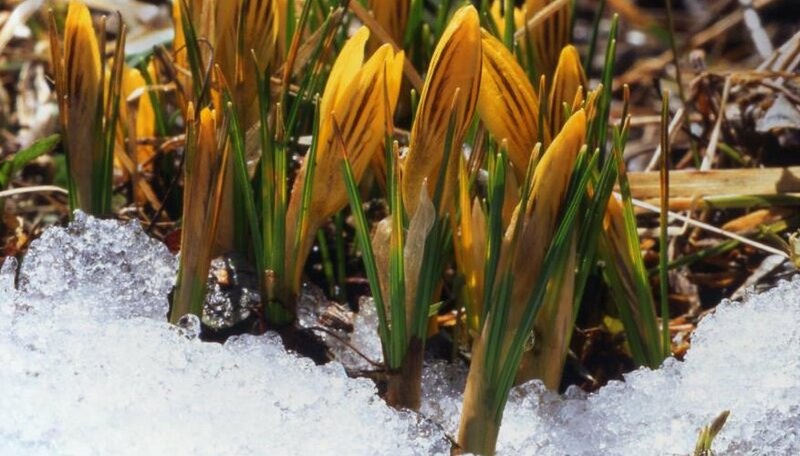 The line between late winter and early spring is different in every region, and a few crocuses bloom so early that they often appear during a late snow. The snow crocus (Crocus tommasinianus) is a purple-flowering species that starts blooming as early as March in some areas. For flowers even earlier, plant another crocus species that also has the common name snow crocus (Crocus chrysanthus). When its gold-yellow flowers emerge, sometimes as early as February, you'll know spring is close behind. These two early-blooming crocuses are hardy in USDA zones 3 through 8. The saffron crocus (Crocus sativus), which is perennial in USDA zones 6 through 8, is a true crocus that blooms in fall. When its purple- to lilac-colored flowers bloom, they look fresh, almost springlike in the fall landscape. The flowers, which last up to two weeks, have a bright-orange stigma -- a three-pronged branchlike structure in the flower center -- that is harvested for the culinary delicacy saffron. Use caution with homegrown saffron, however, because other crocus varieties are highly poisonous and easily confused with the saffron crocus. Many bulbs referred to as autumn crocus are not true crocus bulbs, though they look similar. These fall-blooming bulbs belong to the genus Colchicum, and the most commonly grown ones are hardy in USDA zones 3 through 9, though some are not hardy in all of those zones. They bloom following a dormant summer period. One species commonly called autumn crocus also is known as naked ladies and meadow saffron (Colchicum autumnale). It has purple flowers with white centers and is hardy in USDA zones 4 through 8. Autumn crocus varieties are toxic to people, pets and livestock. Missouri Botanical Garden: Crocus Spp. What Do Buttercup Flowers Look Like? What Is the Meaning of Jonquil Flowers? What Is the Meaning of Snowdrops? What Flowers Are in Season in January?